It has been a while since we did an update on our house, and since MOVING IN has been our main goal this year, it is time to show off our progress. Last time we posted we had just finished installing the cabinets. Since then, we have been checking off the items that we need to get our certificate of occupancy. Electricity was the first thing on our list. Moving the power from the temporary pole to the house meant we were done with all the digging around the house and could get the grading done. 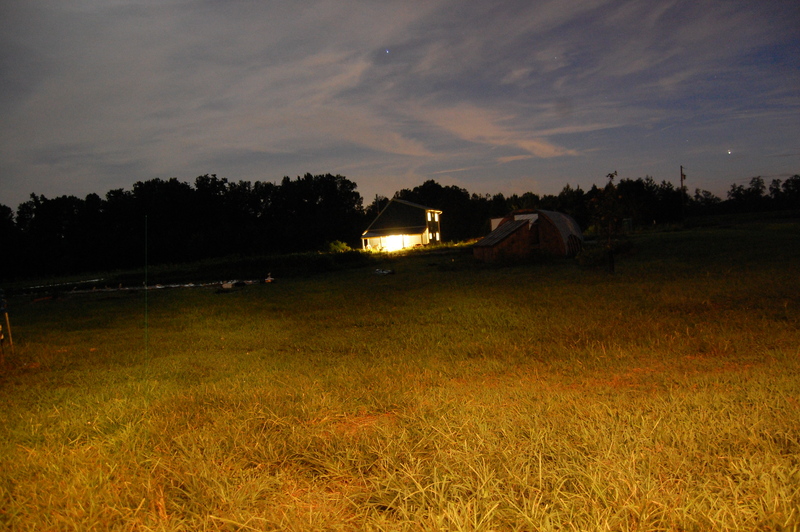 To get the necessary permits to put power on the house, we had to install of of the electrical fixtures. 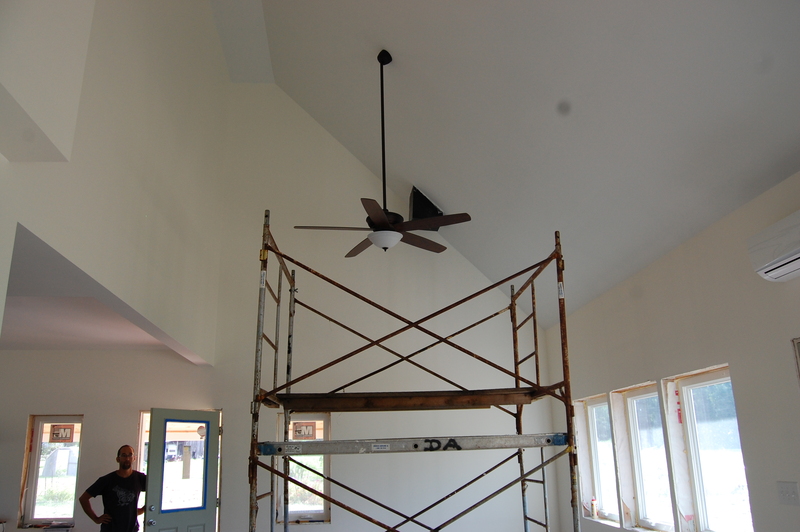 We needed scaffolding to reach these fans in the living room, but once we had them, they made working inside a lot more pleasant. Needing to get the fixtures installed also gave us the push we needed to finish our porch. The porch is a major feature of the house and a big outdoor living space. 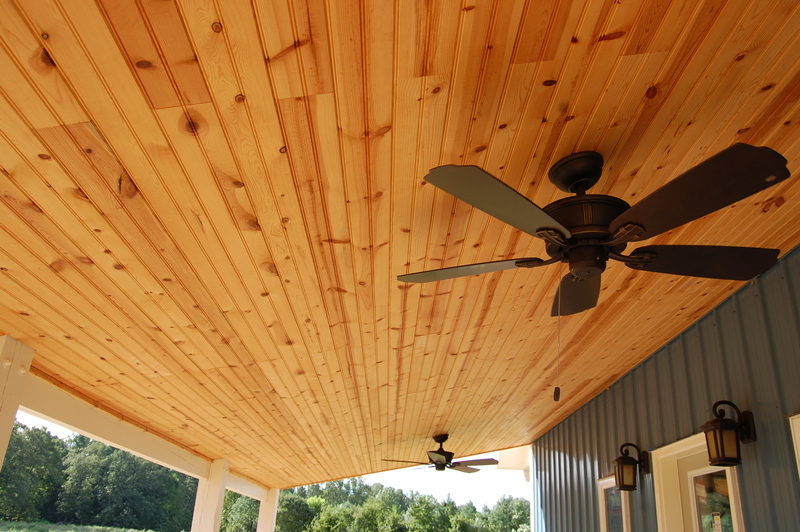 We used beadboard for the ceiling and of course put up ceiling fans for summer comfort. 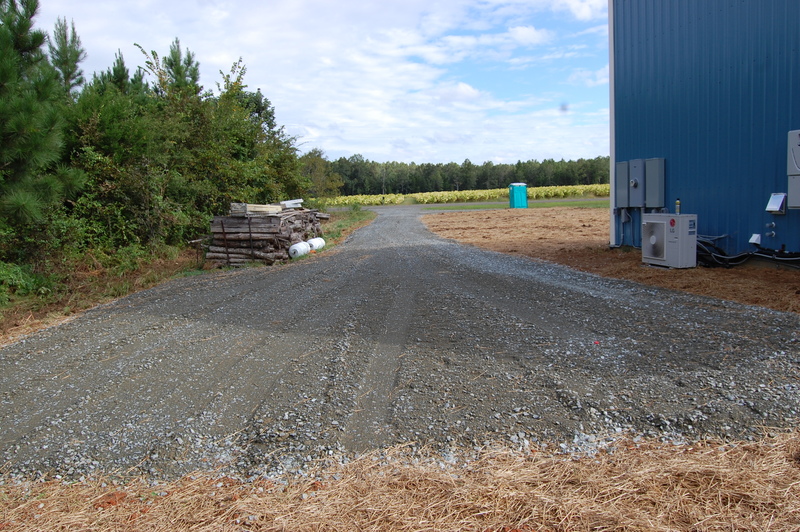 Once the fixtures were installed and the electrical trenching was done, we had the area around the house graded and a driveway installed. 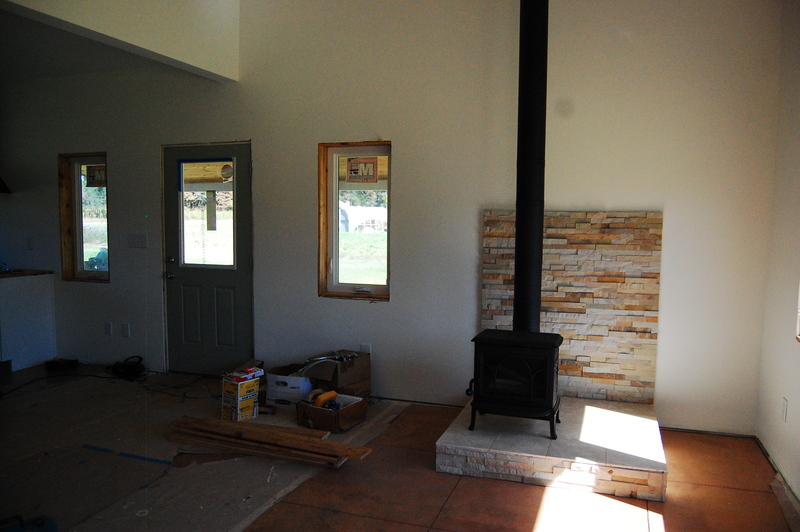 With each passing project it looks more and more like a finished house! While all this work was being done on the outside, on the inside we were working through our list and making the house feel more like home. 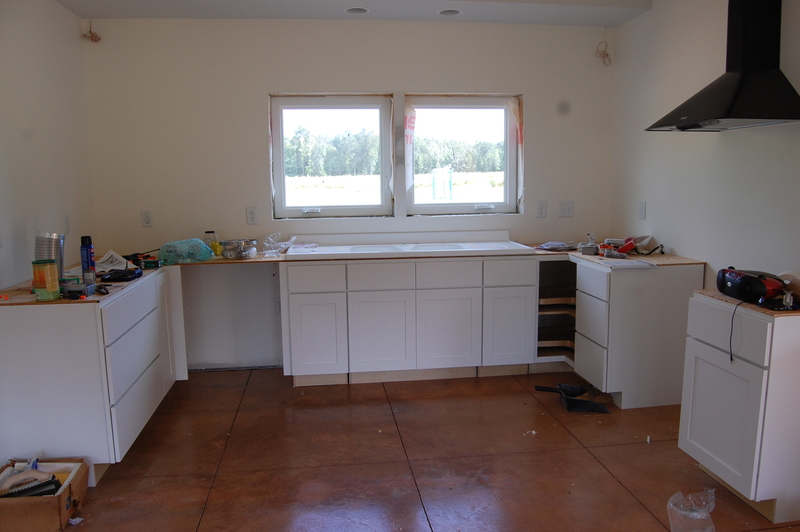 Once we had the cabinets in, we moved on to the rest of the kitchen. 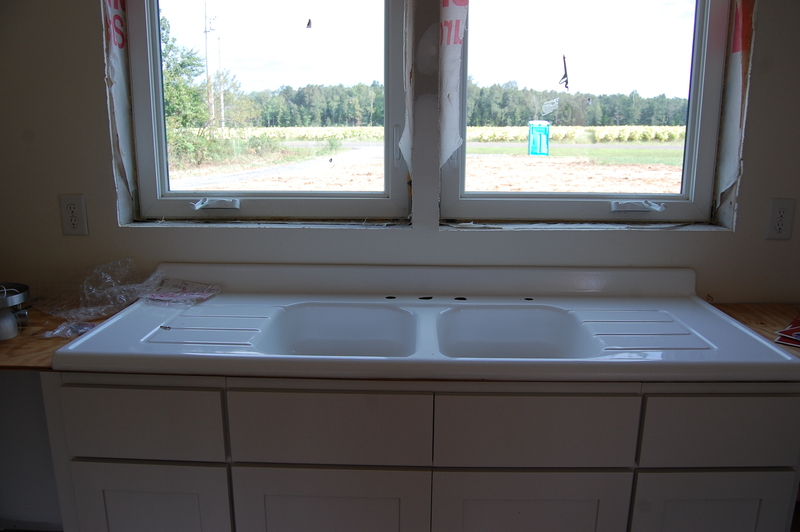 One of our favorite features is our farm sink. 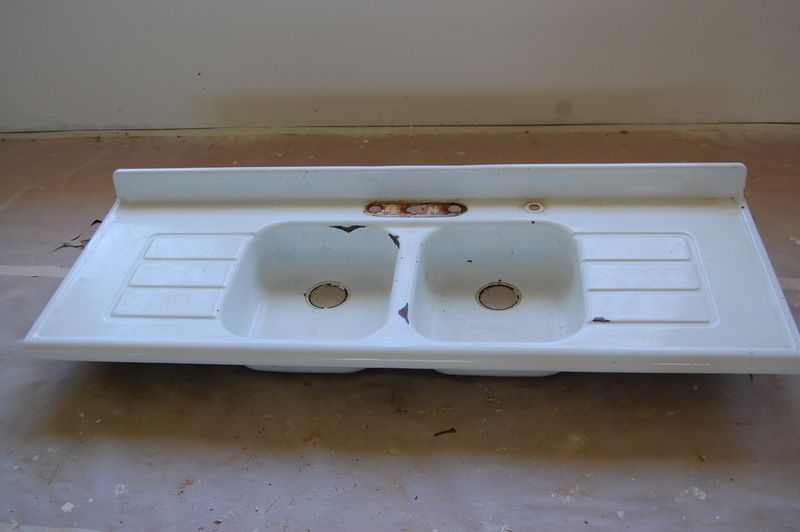 We found this double drainboard sink on Craigslist. When we got it, it had several chips in the enamel, but we had it refinished and can’t wait to use this treasure! 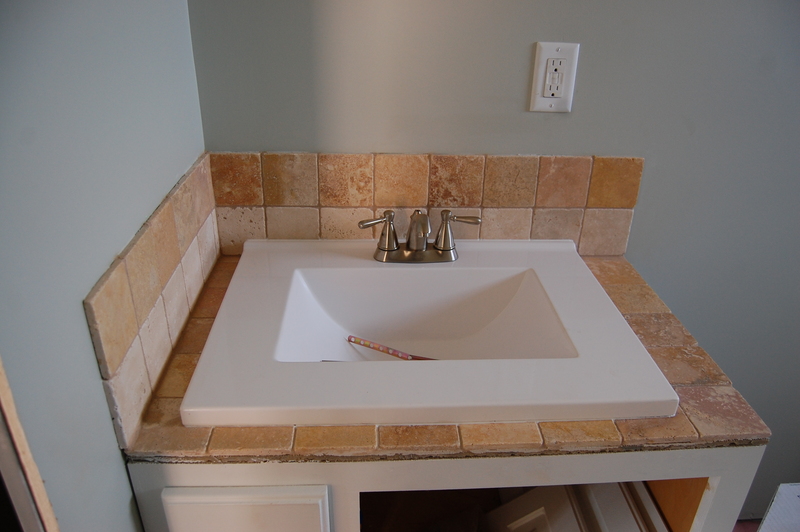 Megan installed a tile top on a reclaimed vanity and we installed the bathroom sink downstairs. 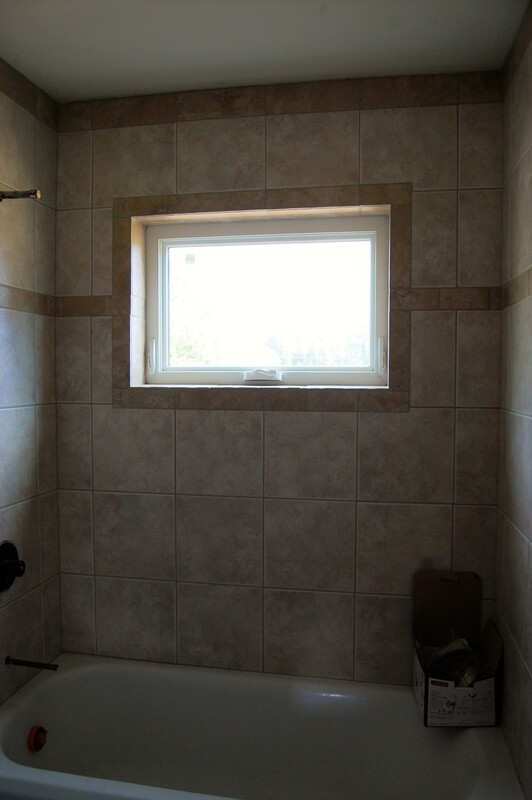 And we hired a colleague of Jonathan’s to do the tile in the shower. He did a great job. 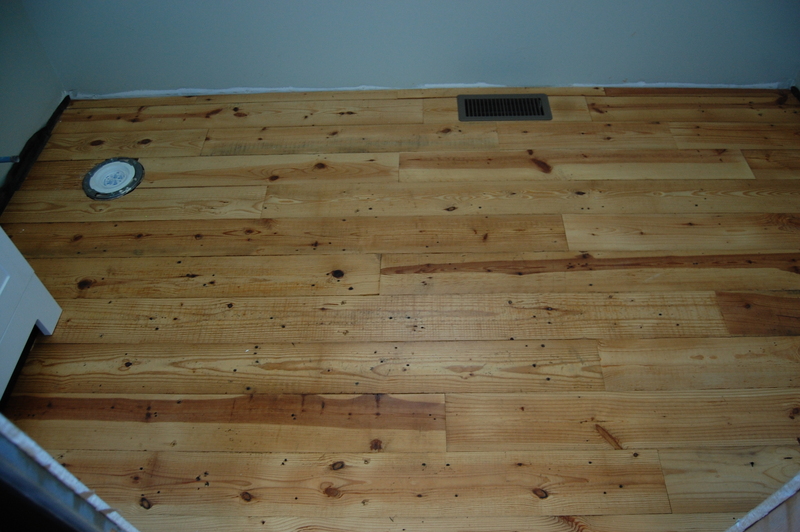 Upstairs, we installed the wood floors that we reclaimed from our church’s 1891 chapel. 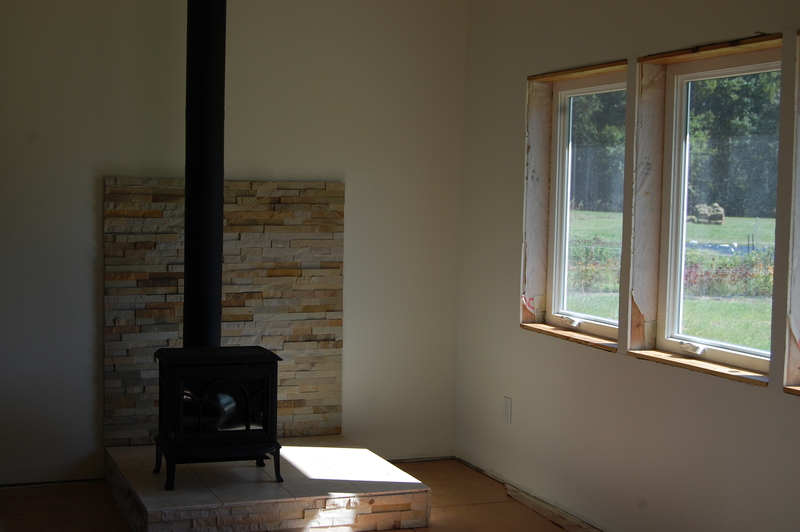 But one of our favorite projects, and one that makes a huge difference making our house into our home is the hearth and wood stove we installed. This is our Jotul F-1 that we found unused on Craigslist. 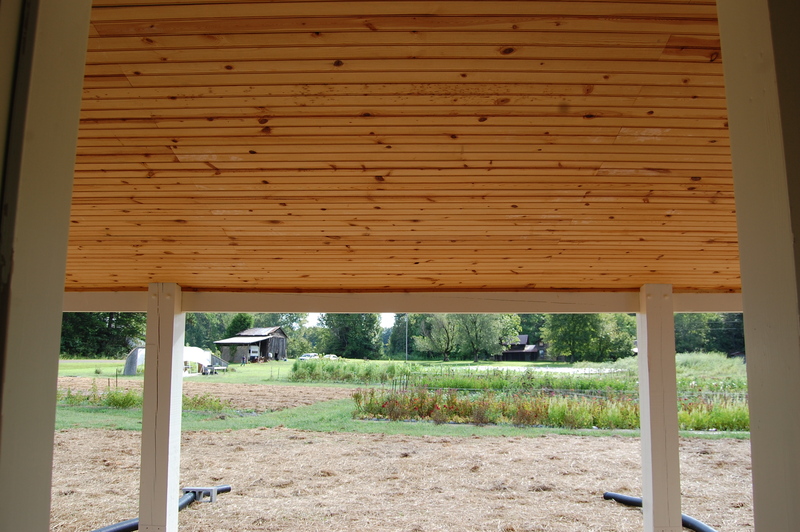 As you can see in the background, we have started on the window trim, the last big project before we can get our c/o. 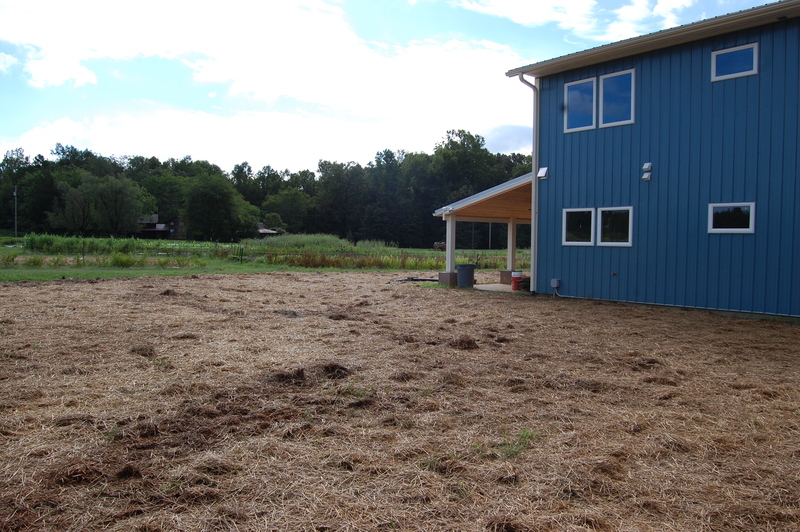 Once we do that we’ll still have a few more project like finishing the floors and installing interior doors, but we are getting closer and closer. So this winter, you know where we’ll be: Sipping hot chocolate in front of a fire, reveling in the hominess of our hearth and the comfort of our home. I love it! You both are doing an amazing job. 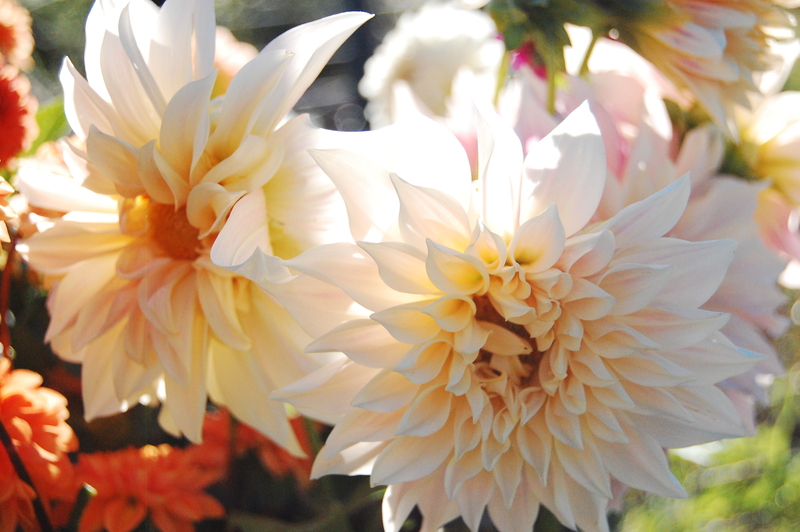 Lovely and exciting and oh so beautiful! Yayy!! Getting so close! Congratulations, it looks like a wonderful home to me!